Jane has been coaching for 21 years and is qualified to Level 3 in foil and Level 1 in Épée. Since becoming a veteran Jane has fenced in 11 Veteran World Championships best foil ranking was 6th. However, her best result to date is a bronze medal at the 2015 Vetran European Épée Championships. In 2009 she won the bronze medal in the Individual Foil at the Veterans' Commonwealth Championships and the gold in the Veterans' Team Foil. She won the Womans' British Veteran Épée Championship in 2010 and the Womans' British Veterans Foil Championships in 2012. As a competitor: Trained in France by three internationally renowned French Fencing Masters (Maîtres Liétar, Dumuin and Gamot). Winner of several school, county and regional French titles and tournaments. French Under 20 Northern France Épée Champion. Winner of French University Cup three years running (68,69,70) as a member of Lille University Fencing Club. Won the French Universities cap in Triangular match v Belgium and Holland. Winner of several county and regional titles in England. Representative honours for Kent, Northamptonshire, Leicestershire counties, and South East, East Midlands and Southern Regions. Regular GBR Veterans Squad member. National over 50s champion in 2008. Participation in two Veterans World Championships (best performance : 8th place in Veterans World Championships in Limoges in 2003). Now retired from all competitions. Coaching experience: Master in charge of Fencing and main coach at Wycliffe College, Oundle and Uppingham Schools between 1979 and 2006. Coaching at Reading Fencing Club 2006- 2010. Some private coaching, mostly adult. Coaching qualifications: BFA Level 4 for Épée, Level 3 for Foil and Sabre Qualifications renewed in 2005 under Hungarian coaches Kopetka, Kiss and Jakab. Full, enhanced child protection certificate issued by British Fencing Association. Pupils’ success: Numerous county and regional titles at all ages, mainly at Foil and Épée with one England schoolboy (Foil), one Public Schools’ Champion (Ladies’ Épée), one Public Schools’ Vice Champion (Men’s Épée) and one National Schools Team Title (Under 18 Épée). Marion started her fencing career at the Olympic Centre in Offenbach, where she was taught and trained by the national Coach for Germany. 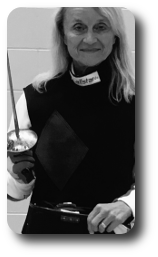 Her passion for foil "...it is the formula One of fencing with its finely-tuned technical complexity and speed..."
Has taken her around the world to participate in all major fencing events. "Having the opportunity to share my experience and love for fencing as a teacher and coach is a huge privilege and a great joy". Marion currently holds a BFA Foil level 2 award for coaching. Dominiquie is a Foil (BFA Grade 1) and a Sabre (BFA Grade 1) coach. Keith is a Foil (BFA Grade 2) coach.